Remember Napster? Of course we all do. The once popular source of downloadable mp3’s which have gone through so many trials after finally re-establishing itself as a legit music source is expanding its services to all mobile phones. Napster has just launched Napster Mobile. 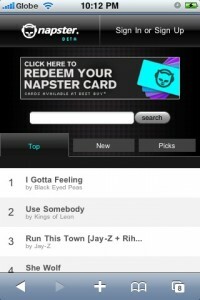 Napster Mobile hopes to be your one-stop mobile shop for all your MP3 downloading needs. It supports downloading of MP3’s “over-the-air” and will charge you only $5/month. That’s inclusive of 5 mp3 downloads on your mobile phone. and unlimited streaming using your PC. In addition, you will also receive back-up copies of the MP3’s you bought and can be stored on your PC. The MP3 offer is good for all mobile phones regardless of the mobile carrier or content plans. To start buying MP3’s you simply need to sign in using your Napster credentials, or if you don’t an account yet, now is the best time to register at Napster. And as a promotional gig, Best Buy offering $15 worth of Napster Music (that equates to 15 songs that can be kept indefinitely and 3 months of unlimited listeing using your PC. To access Napster mobile, simply point your mobile phone browser to m.napster.com.